Irene is inspired by Italo Calvino’s description of a city called Irene in his book “Invisible Cities”. The city was a place to be wondered about by travelers but not entered, it could be both a happy place and a solemn place, but could never be completely understood. 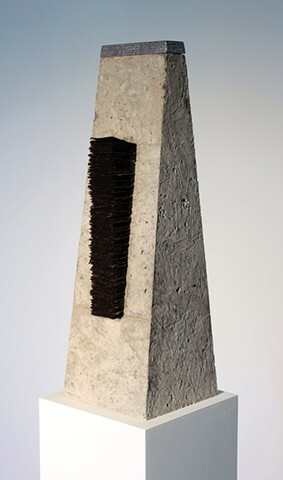 In that vein, this sculpture is intended to be contemplated and interpreted by and for the individual. Stamped into the aluminum cap at the top of the monolith is Calvino’s entire description of the city from the book. “Irene is the city visible when you lean out from the edge of the plateau at the hour when the lights come on, and in the limpid air, the pink of the settlement can be discerned spread out in the distance below: Where the windows are more concentrated, where it thins out in dimly lighted alleys, where it collects the shadows of gardens, where it raises towers with signal fires; and if the evening is misty, a hazy glow swells like a milky sponge at the foot of the gulleys. Travelers on the plateau, shepherds shifting their flocks, bird-catchers watching their nets, hermits gathering greens: all look down and speak of Irene. At times the wind brings a music of bass drums and trumpets, the bang of firecrackers in the light display of a festival; at times the rattle of guns, the explosion of a powder magazine in the sky yellow with the fires of civil war. Those who look down from the heights conjecture about what is happening in the city; they wonder if it would be pleasant or unpleasant to be in Irene that evening. Not that they have any intension of going there (in any case the roads winding down to the valley are bad), but Irene is a magnet for the eyes and thoughts of those who stay up above. At this point Kublai Khan expects Marco to speak of Irene as it is seen from within. But Marco cannot do this: he has not succeeded in discovering which is the city that those of the plateau call Irene. For that matter, it is of slight importance: if you saw it, standing in its midst, it would be a different city; Irene is a name for a city in the distance, and if you approach, it changes.